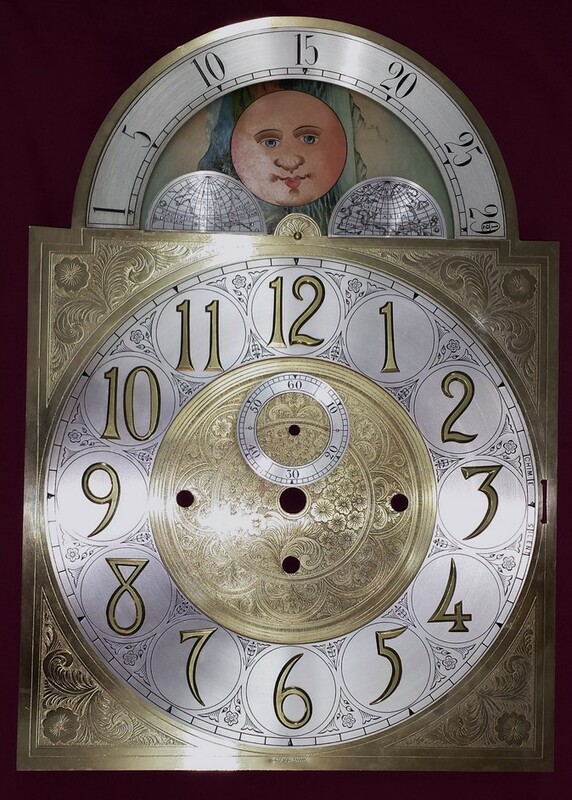 Clock dials are often damaged since they are frequently touched during the process of setting the hands on a clock. Other times they are damaged by misguided attempts at cleaning. This dial is a great example not of an original dial in worn condition but a dial that has had someone make a very poor attempt at both restoring the pan and replacing the dial. The original dial pan would have had brass plating but it has been painted over. The poorly cut paper dial is a generic replacement. The above dial after restoration. The dial pan was painted previously. Unfortunately, after removing the paint we found that that the original brass plating was missing. Since the owner did not want to pay to have it re-plated we re-painted the dial pan and glued down a proper dial replacement. 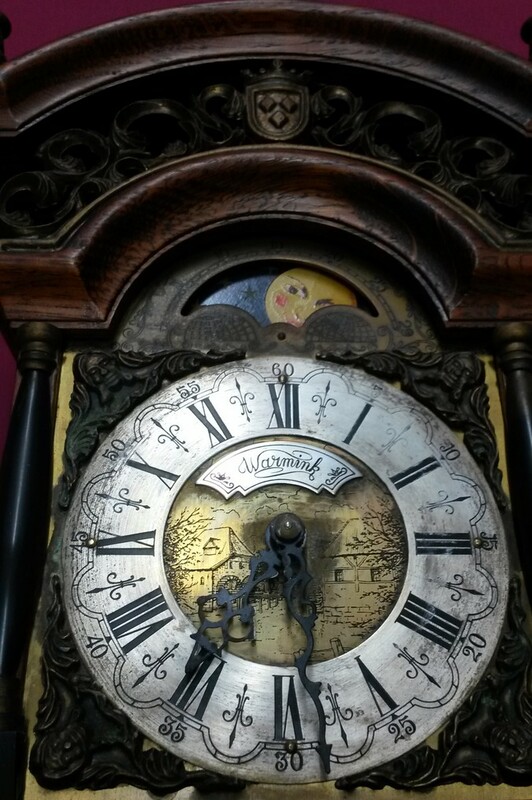 Here is another example of a dial that someone tried to restore but did a poor job. The dial pan has been painted brass over what would have been a silver finish and when the new paper dial was installed it was cut badly and too much glue was used. 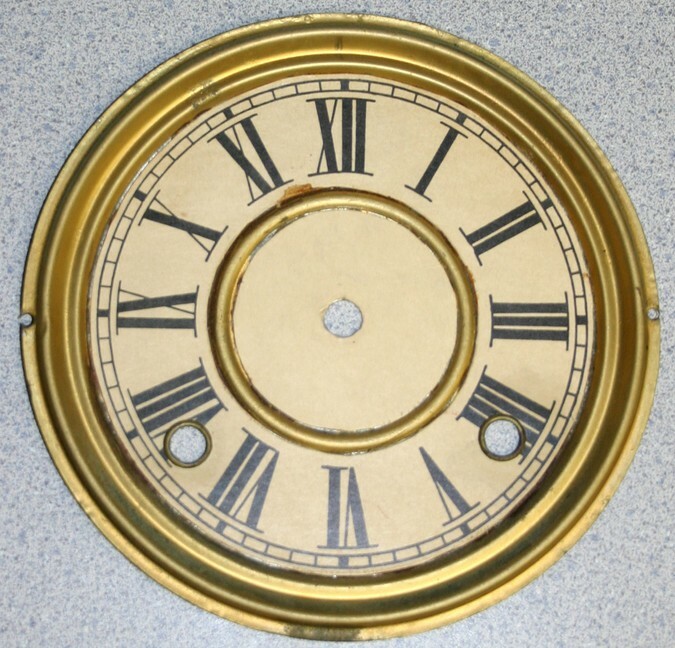 This is the same dial above with the brass colored paint removed showing the silvered dial pan underneath. Some of the silvering is missing and or damaged but it still looks better than the painted version above. Also a proper "Ingraham" reproduction dial was used. Notice the trademark at center and the "made by" designation under the number six. 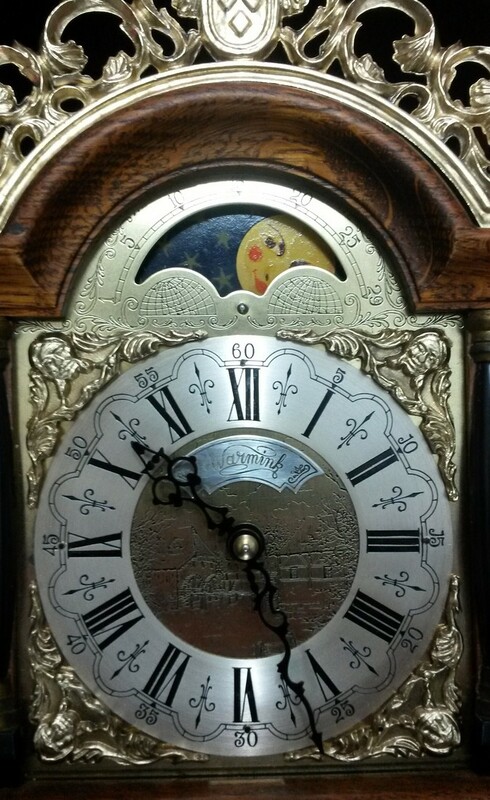 Periodically we are privileged to have a customer wanting us to perform a full restoration of a clock; movement, case and dial. 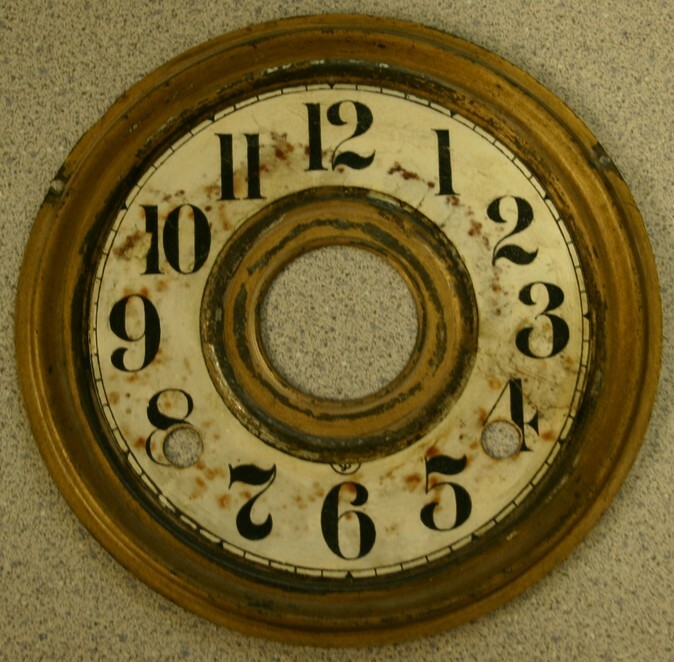 Here is a picture of the dial before restoration. The case can be found in the case section. 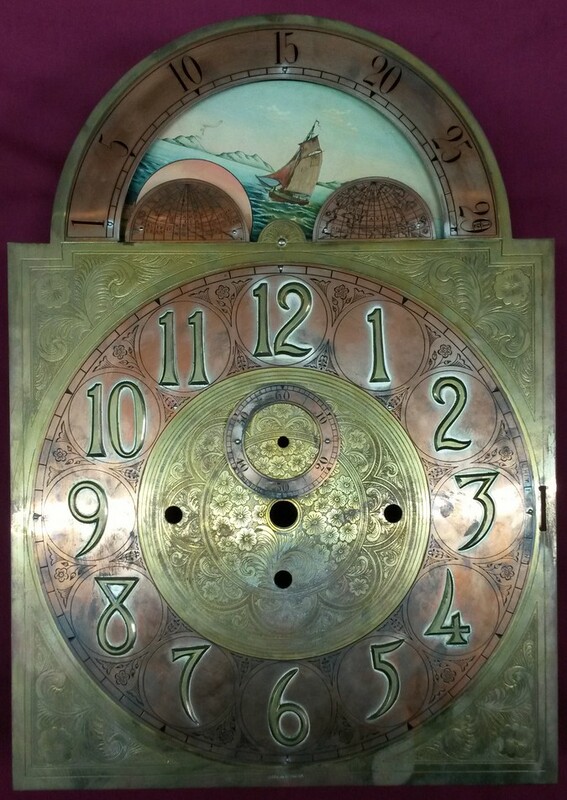 After dismantling the dial into its several components the brass pieces were cleaned, polished and re-lacquered. The chapter ring (the silver part) was stripped completely, re-silvered and the numbers re-inked. What a shame. This is a very heavy, very expensive dial but it has been mishandled for too many years. What was once a very handsome dial has been reduced to this sad state. 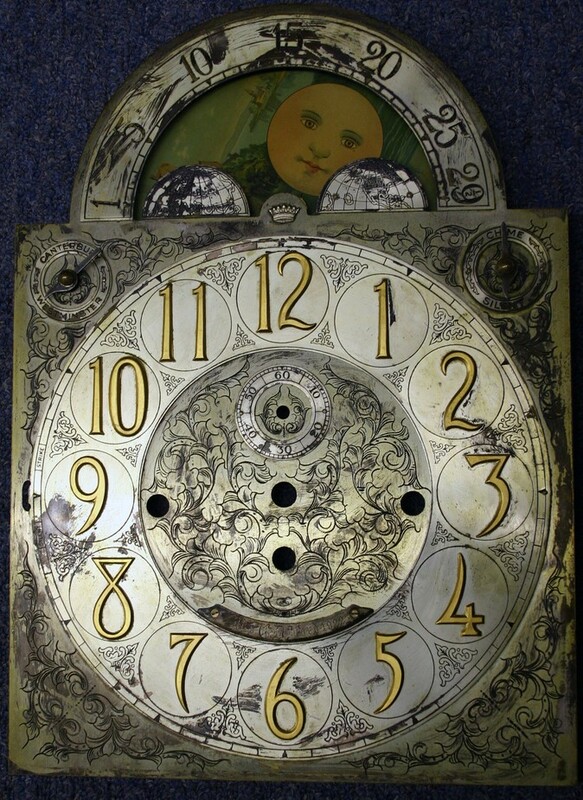 Proper restoration of these dials requires that all of the individual components be removed, restored and reassembled. 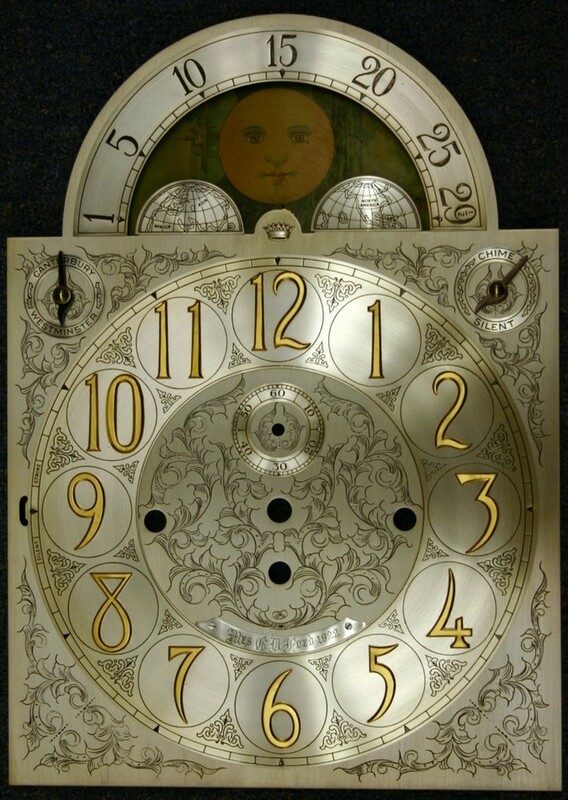 This dial alone has 22 separate components not counting the moon dial and dial indicators. Wow! What a beautiful transformation after proper restoration. Although the numbers on this dial look pretty good someone made a poor attempt at repainting the designs in the dials corners and in the arch. The date dial underneath where the hand shaft would come through looks like someone glued a piece of paper to it and used a red ink pen to try to put the numbers back on. Above dial restored. Looks a bit better now doesn't it? 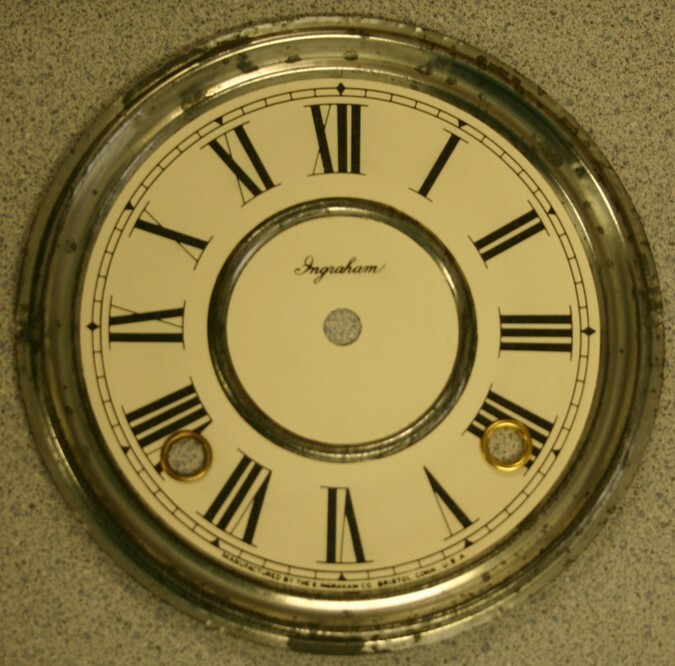 If this were your clock would you have restored the dial like above or left it alone like the "Before" picture? 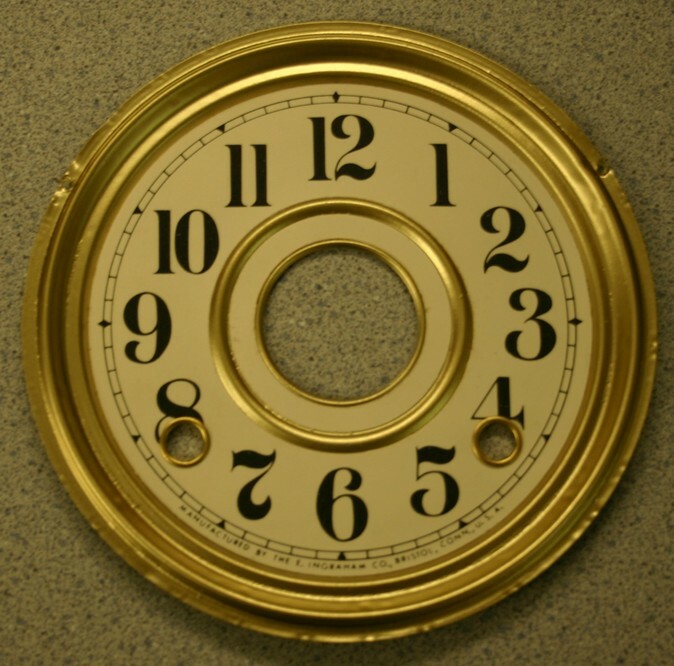 This dial is from a very nice tubular bell floor clock that was located inside a sorority house. You can see that it had been poorly cared for over many years. During a remodeling project at the sorority house I convinced the administrators to restore the clock properly. Not only did we completely clean the movement and case we were also authorized to restore the dial to its former beauty.